All the Joshi wrestlers above have profiles on Joshi City, you can click on their names above to go straight to it. I think all the matches are shown in full even though its on Samurai TV, but if any are too clipped I’ll make a note in the review. The show begins with a match between Rin Kadokura, a young wrestler from Marvelous, against Satsuki Totoro out of the Ice Ribbon promotion. Rin Kadokura is a tag team champion in WAVE with Takumi Iroha and already has shown a lot of promise in her short career. Satsuki has been wrestling almost a year and I am still not as impressed with her, she still has a ways to go to becoming a complete wrestler. Satsuki immediately goes after Rin and hits a shoulderblock, but Rin gets back up and the two trade elbows. Dropkick by Rin and she hits two more, Satsuki ends up against the ropes and Rin dropkicks her two more times. Scoop slam by Rin, and she covers Satsuki for two. Rin goes up top but Satsuki recovers and elbows her, headbutt by Rin and she connects with the missile dropkick. Rin jumps on Satsuki’s back but Satsuki shakes her off, Rin flings Satsuki to the mat and covers her for two. Hurricanrana by Rin, but that gets a two as well. Satsuki knocks down Rin with a lariat, sentons by Satsuki and she covers Rin for a two count. Satsuki gets on the second turnbuckle and hits a diving senton, she then goes all the way up top but Rin jumps up and elbows her before she can jump off. Rin throws Satsuki to the mat and the two trade flash pins with neither getting the three. Sloppy La Magistral of sorts by Rin, and she gets the three count! Rin Kadokura is the winner. My opinion of Satsuki remains unchanged. Just a really rough match, lots of mistakes, and a botched ending. Since Rin is generally pretty solid, I’ll assume most of the blame goes to Satsuki, this felt like a match with two debuting wrestlers which both are past by now. Sub-par way to start the show. SUGI has returned to wrestling! Since this is Joshi City I won’t bore everyone with how much I love SUGI, but he was one of the top high flyers in the world almost a decade ago as Yoshitsune but has been out of wrestling for many years. ASUKA is slightly heelish now as she has joined the Voodoo Murder faction (with TARU as the leader), while Mika Iida is also from Pro Wrestling WAVE. Oh, and Natsuki Taiyo is the referee, so its a wacky high speed wrestling match. ASUKA boots Taiyo before the match even starts for reasons unknown while SUGI and Mika go at it, ASUKA comes over but SUGI flips away from both of them. Mika gets the better of things and puts ASUKA in a figure four, SUGI tries to break it up but he misses, leading to Mika putting him in a facelock while still maintaining the figure four. She lets go after a moment, SUGI and ASUKA both attack Mika and drop her with a double vertical suplex. ASUKA hits a body press on Mika, both she and SUGI bounce off the ropes until SUGI hits a swandive hurricanrana. ASUKA lands on out of the ring, SUGI goes off the ropes but does a fake dive instead of sailing out of the ring. Mika and ASUKA trade elbows on the floor, Mika gets on the apron and snaps SUGI’s arm over the top rope. ASUKA goes up top and hits a diving crossbody, dropkick by ASUKA and she chokes SUGI in the corner. SUGI throws ASUKA into the other corner but ASUKA springboards out of it with a moonsault, Space Rolling Elbow by ASUKA but Mika returns and knocks her to the mat. SUGI puts a submission on Mika over the top rope but ASUKA boots him, Mikai dropkicks ASUKA while she is against the ropes and she trade elbows with SUGI. SUGI wins the battle but Mika breaks up the cover, drop toehold by Mika and she dropkicks SUGI in the head. SUGI kips up but Mika hits him with a running uppercut, SUGI kips up again and he superkicks Mika in the head. SUGI goes off the ropes but Mika rolls him up for two, another cradle by Mika but SUGI reverses it and they go back and forth. ASUKA gets back in and dropkicks Mika, but Mika drops her and SUGI with a DDT/reverse STO combination. Octopus Hold by Mika but ASUKA breaks it up with a missile dropkick, ASUKA picks them up and goes for a double chokeslam, but they push her off. ASUKA superkicks SUGI before hitting a gutwrench suplex, she goes off the ropes but Taiyo trips her. Cradle by Mika to ASUKA but that gets two as well, victory roll by Mika to ASUKA and she gets the three count! Mika Iida wins! Even by High Speed standards, this was pretty lackluster. It didn’t have the charm that most of the High Speed matches have, no real “sprint” moments and Taiyo was less a part of it than she usually is. While I enjoy seeing SUGI again, a disappointing match. I am assuming this match follows traditional Captain’s Fall rules, in which the match is under elimination rules until the Captain is pinned. The teams are pretty random with different promotions on each side. Mio and Takumi are from Marvelous, Chigusa Nagayo’s promotion, while Akane Fujita, Kurumi, and Fujimoto are from Ice Ribbon. 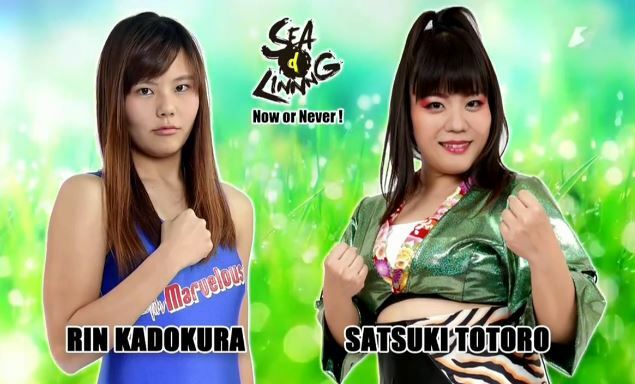 Nagahama and Mizunami hail from WAVE, while Captain Saki Akai is a popular DDT wrestler/model. A very unique assembly of wrestlers, we’ll see how they get along with and against each other. Mio and Saki start the match but Mio immediately bails out of the ring and Saki is triple teamed by the rest of her team instead. After getting dropkicked repeatedly, Mio is brought back into the ring and Ryo throws Mio onto Saki for a two count cover. Mio goes off the ropes but Saki catches her with The Claw, Mio breaks free however and delivers a dropkick. Mio tries for multiple covers with no luck, Kurumi runs in and decks her, giving Fujimoto time to drag Saki to her corner so she can tag in. Hiroe also is tagged in and she dropkicks Fujimoto, another dropkick by Hiroe and she hits two more for a quick cover. A Northern Lights Suplex but Hiroe also gets a two, she goes for a backdrop suplex but Fujimoto lands on her feet and rolls up Hiroe before kicking her in the chest. Fujimoto goes up top but Hiroe avoids the diving body press, scoop slam by Hiroe and she tags in Akane. Akane hits a scoop slam as well, Ryo is then tagged in and she does the same. Mio tries a slam as well but Fujimoto cradles her for a two count, Mio is collected by her team as Ryo returns as the legal wrestler and chops Fujimoto into the corner. Fujimoto switches positions with her and hits chops of her own but Ryo takes back over, jumping elbow by Ryo in the corner and she hits a lariat. Cover by Ryo, but Fujimoto kicks out. Ryo tags in Hiroe, snap verticals by Hiroe and her team runs in to help, but Fujimoto dropkicks all of them and tags in Kurumi. Shoulderblocks by Kurumi to Mio’s team but she can’t knock over Ryo as the two go back and forth with shoulderblock attempts. Kurumi wins the battle, body avalanche by Kurumi and she hits the somersault senton for a two count. Kurumi tries to pick up Ryo but Ryo slides away, hard elbow by Ryo but Kurumi catches her with a swinging side slam. Kurumi tags in Takumi, Saki comes in too and they both kick Ryo. Release German by Takumi but Ryo ducks the superkick and hits a series of elbows. Irish whip by Ryo but Takumi connects with a spinning heel kick, Takumi goes up top but Ryo joins her and hits an avalanche powerslam. Ryo picks up Takumi but Takumi elbows her off, kick by Takumi but Ryo hits an overhead suplex followed by a lariat. Uranage by Ryo and she tags in Akane, chops by Akane against the ropes and she tosses Takumi to the mat. Hiroe and Mio come in to help, elbow drop by Akane and she covers Takumi for two. Takumi delivers a kick combination, Fujimoto comes in and they double team Akane. Ryo tags in Saki and Saki boots Akane in the corner, the rest of her team also comes in to attack Akane in the corner before Saki kicks Akane in the head. Akane ducks the next kick attempt and hits a modified Samoan Drop, Akane picks her back up and hits an over-the-shoulder powerslam for two. Akane puts Saki in a choke but Takumi breaks it up, things break down as both teams are in the ring trading blows. Takumi and Kurumi both go up top and hit body presses, Fujimoto dropkicks Mio in the corner but Mio takes down both Fujimoto and Saki. Mio is tagged in, she cradles Saki but it gets two. Mio goes off the ropes but Takumi grabs her from the apron, Saki goes for a boot but Mio moves out of the way. Mio goes up top but Kurumi grabs her from the apron, Hiroe tosses down Saki and helps Mio hit a senton for two. Knee by Mio but Takumi superkicks her when she goes for the Code Red, everyone jumps on Kurumi’s back as she hits a body press onto Mio, cover by Saki but Mio gets a shoulder up. Saki picks up Mio and hits a strike combination, she goes off the ropes but Akane runs in and chops her. Lariat by Ryo, Mio covers Saki but it gets broken up. Fujimoto goes up top but she dropkicks Saki by accident, roll-ups by Mio but Saki keeps kicking out. Mio goes off the ropes but Saki boots her in the face, pump kick by Saki as Mio gets up and she covers her for the three count! Team Saki Akai are the winners! I am not sure why this match is happening but I am so glad it is. One of my bigger complaints of 2017 is Arisa Nakajima really took a back seat, as while she had some big matches with Tsukasa Fujimoto she didn’t do anything memorable in singles matches. Hopefully this is a sign that 2018 will be different, as she takes on the former at the time (now current) WAVE Champion on her home turf. This is their first singles match since 2013, however Arisa and Misaki did battle a number of times last year as part of the Best Friends vs. Avid Rivals feud, which ended at 1-1-1. A big special attraction match that I am sure will deliver. They feel each other out to start, Arisa gets Misaki to the mat first but Misaki switches positions with her as they jockey for position. They trade wristlocks until they end up on the mat again, they trade headlocks but reach a stalemate as they return to their feet. After trading elbows, Sling Blade by Arisa but Misaki shoves her to the mat and knees Arisa in the midsection before flinging her down by the hair. She does it again, stretch hold by Misaki and she delivers a curb stomp. Another curb stomp by Misaki, she kicks at Arisa as she returns to her feet and elbows her into the corner, Misaki knocks Arisa out to the apron but Arisa knocks her back and slingshots back into the ring. Dropkick by Arisa and she boots Misaki in the head, dropkick by Arisa and she goes to the top turnbuckle, hitting a missile dropkick. Cover by Arisa, but it gets a two count. Arisa knees Misaki but Misaki rolls her up for two, elbow by Misaki and she hits a low crossbody while Arisa is against the ropes. Misaki gets on the top turnbuckle but Arisa hits her before she can jump off and joins her, elbows by Arisa but Misaki elbows her back and crossbodies her down to the mat. German suplex hold by Misaki, she rolls Arisa up and hits two more, but Arisa gets a shoulder up on the last one. Misaki picks up Arisa but Arisa delivers the Cutie Special, knees by Arisa but Misaki slides her to the mat and goes for a cross armbreaker. Arisa gets out of it, sunset flip by Arisa but Ohata reverses it. Arisa puts Misaki in a submission but lets go after a moment, running boot by Arisa and she connects with the double underhook facebuster. Arisa goes up top and nails a diving footstomp, cover by Arisa but it gets a two count. Arisa goes back up top and goes for a moonsault, but Misaki gets her feet up. Both wrestlers slowly get up and begin trading elbows, Package German by Nakajima but it gets two. Arisa goes for a full nelson suplex but Misaki blocks it and hits a full nelson suplex of her own, they get up and trade elbows again, Arisa goes off the ropes but Misaki catches her with a spinning backfist. Fisherman Buster by Misaki, but Arisa barely gets a shoulder up. Misaki picks up Arisa but Arisa slides away, Misaki cradles Arisa but Arisa kicks out. Misaki goes for a backfist but Arisa comes back with elbows, kick to the head by Arisa and she delivers he full nelson suplex for a two count. Arisa goes for the DxD but Misaki blocks it and hits the Schwein, she picks up Arisa but Arisa rolls away and kicks Misaki in the head. Release dragon suplex by Arisa and she nails the DxD Suplex for the three count! Arisa Nakajima wins the match! Time for the main event! 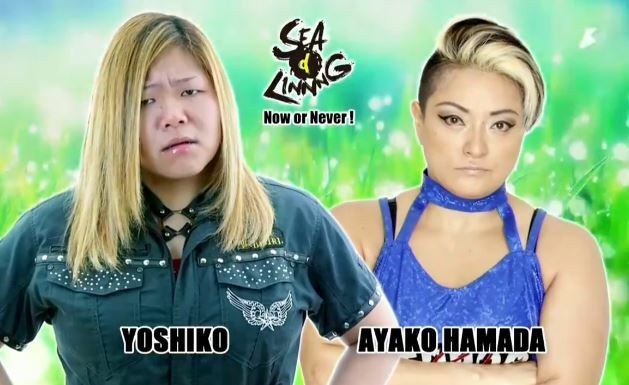 Ayako Hamada is a Pro Wrestling WAVE wrestler but ventures into SEAdLINNNG quite a bit, as this is her 8th match in the promotion. 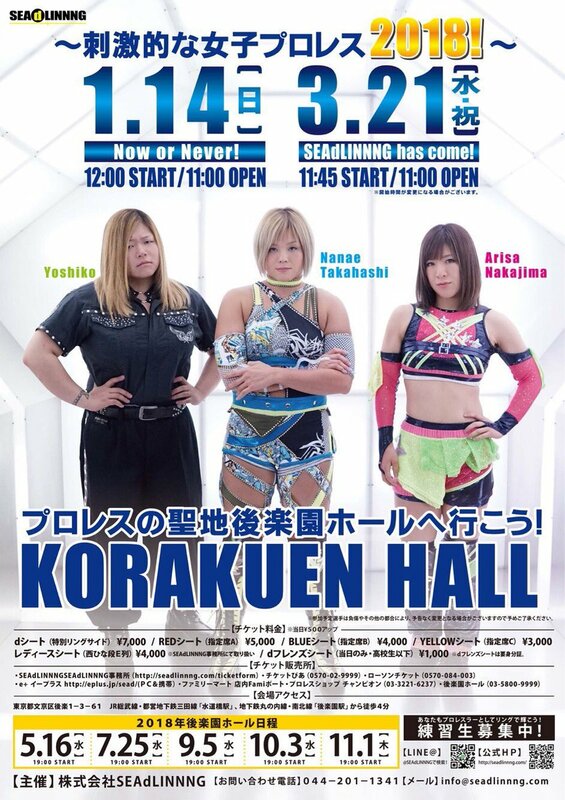 These two haven’t faced off since 2016 however so they weren’t feuding in particular, however in Nanae Takahashi’s absence it is up to Yoshiko to defend the promotion’s honor as the young Aace. Ayako Hamada is a seasoned vet and is historically difficult to pin, so Yoshiko has an uphill battle in going for her first career pinfall victory over the former WAVE Champion. Yoshiko acts like she is going to shake Hamada’s hand but pulls her down to the mat instead, Hamada gets back up and they go into a Test of Strength. Hamada gets the better of it and applies a leg submission into a STF, but Yoshiko gets into the ropes. Irish whip by Hamada but Yoshiko springboards out of the corner with a lariat, she charges Hamada but Hamada moves and Yoshiko tumbles out of the ring. Hamada goes out after her and tosses Yoshiko into the crowd as they make a tour around the ringside area. Hamada takes Yoshiko up onto the stage but Yoshiko blocks the suplex attempt and hits a vertical suplex of her own. They eventually both make it back to the ring and trade elbows, kick by Hamada and both go for shoulderblocks with no success. Yoshiko finally knocks over Hamada with a shoulderblock, bootscrapes by Yoshiko and she boots Hamada in the face. Kick by Yoshiko and she hits a running senton, she picks up Hamada but Hamada applies a standing armbar. Yoshiko gets out of it and applies an abdominal stretch, but Hamada reverses the hold. Hamada reverts it to an Octopus Hold and rolls Yoshiko to the mat as she also applies a headscissors, Yoshiko gets out of the hold, Hamada goes off the ropes but Yoshiko catches her with a Samoan Drop. Running senton by Yoshiko, she gets on the second turnbuckle but Hamada avoids the diving senton. Kick by Hamada, she gets on the second turnbuckle and delivers a moonsault. She then goes all the way up but Yoshiko recovers and tries to powerbomb her, but Hamada reverses it into a hurricanrana for two. High kick by Hamada, Yoshiko falls out of the ring and Hamada goes up top, but Yoshiko pulls her down onto the apron. Hamada drops Yoshiko face-first onto the apron, she goes up top again but Yoshiko rolls back into the ring and joins her. Yoshiko gets Hamada on her shoulders and hits an Avalanche Samoan Drop, she quickly gets on the second turnbuckle but Hamada shakes the ropes so she doesn’t jump off. Hamada joins Yoshiko but Yoshiko headbutts her and flips over her before dropping Hamada with a powerbomb. Lariat by Yoshiko, she goes off the ropes and hits a sliding lariat, but Hamada kicks out of the cover. Yoshiko goes of the ropes but Hamada catches her with a heel kick, leaving both wrestlers down on the mat. Both wrestlers slowly get up, high kick by Hamada and she delivers a lariat for a two count. Hamada picks up Yoshiko but Yoshiko levels her with a lariat of her own, she picks up Hamada but Hamada catches her with a Liger Bomb for two. Hamada quickly drags up Yoshiko and hits another powerbomb, but Yoshiko again kicks out. Hamada drags Yoshiko to her feet but Yoshiko hits a chokebomb, lariat by Yoshiko but Hamada kicks out at one. Yoshiko drives Hamada to the mat with a fireman’s carry slam, she goes off the ropes and hits a lariat, but Hamada doesn’t go down. High kick by Hamada and she hits two more, with a final heel kick sending Yoshiko to the mat. Another jumping kick by Hamada and she nails the AP Cross for the three count! Ayako Hamada wins! My main issue with matches like this, and perhaps it is because I watch too much wrestling, is it followed a predictable pattern. The brawling segment around the crowd wasn’t needed as it had nothing to do with the story – as soon as both got into the ring it was as if nothing happened and they continued on as usual. Both wrestlers were at fault of at times recovering way too quickly, whether it be from a long submission hold or power move, and it felt like they were just going back and forth with little story. That being said, the action itself was solid and both were putting in maximum effort, with lots of hard strikes and exciting moments. The end stretch felt a bit too stretched but was probably necessary to make sure Yoshiko looked strong even in defeat. Certainly not a bad match, but not as entertaining as the last few matches, as it felt like they were trying to put on an epic match that never fully clicked. The card no doubt got shuffled a bit with Nanae Takahashi’s unexpected absence, but still a pretty solid effort. The first two matches were throw-aways but the Captain’s Fall Match was mindless midcard fun and Arisa Nakajima vs. Misaki Ohata was very entertaining. The main event was decent enough but a bit disappointing, it felt like they were trying to make the match bigger than it was as if they focused on the strikes and less of the “extra” stuff it would have been better. Top to bottom not a bad card but not a must-see show either, SEAdLINNNG tends to be hit and miss but this event was right down the middle overall.